St Clare HospiceOur care and servicesTake part in our community art project! Take part in our community art project! 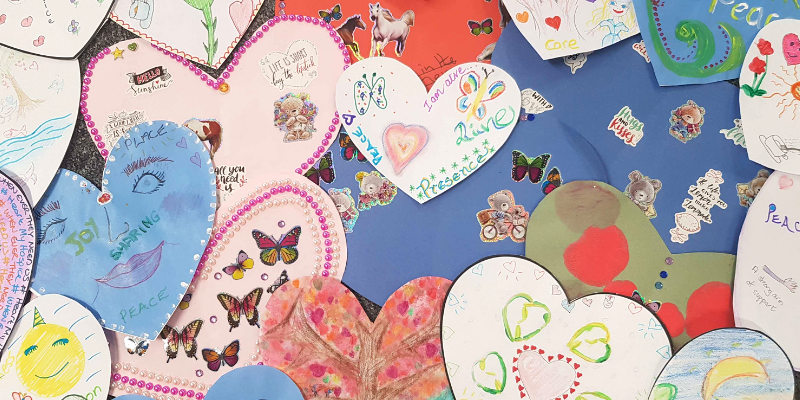 St Clare Hospice is encouraging more local people to get involved with our inspiring community art project, ‘Heart your Hospice,’ before it ends next month. The project launched during Hospice Care Week (8th-14th October 2018) and has been touring around West Essex and East Herts for the four months since. St Clare has received dozens of submissions in that time, but is still encouraging locals to ‘take part and make a heart’ before the project closes on Valentine’s Day (14th February 2019). The Hospice’s Community Engagement Manager, Sally Muylders, is running the art project as a way to open up hospice care, and raise awareness of St Clare’s free services to more people from across West Essex and East Herts. Groups from more than a dozen different community organisations have already taken part in the art project, including people from U3A, Maybury Open Door and Honey Tree Court art group. Simply download the template, cut out the heart shape provided, decorate it and return it with your name and contact details to: FAO Sally Muylders, St Clare Hospice, Hastingwood Road, Hastingwood, CM17 9JX.